SoFi, or South of Fifth, provides a quiet oasis in otherwise bustling SoBe, or South Beach, an area of Miami Beach known for trendy clubs, Art Deco architecture, and throngs of tourists and locals. 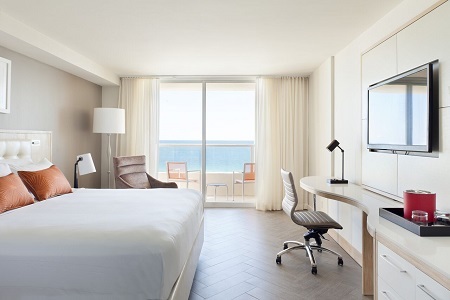 From SoFi it’s a short walk to SoBe’s nightlife along Collins and Washington avenues as well as to the livelier – and noisier – parts of Ocean Drive. That’s why we chose a hotel in SoFi, the neighborhood that encompasses South Beach’s five southernmost blocks. Staying here put us within walking distance of the hoopla but gave us the relative quiet of a residential area, especially nice for evening strolls. And SoFi is no backwater. Boutique hotels, bigger properties, as well as luxury condominium buildings and good restaurants, draw savvy tourists and wealthy residents. South Pointe Park: At the southernmost tip of the island, South Pointe Park reopened in 2009 after a $22 million renovation. The park offers sweeping ocean views, a playground, interactive water sprays, a dog park, and green lawns for sunbathing and sports. From the 450-foot pier, opened in 2014, you can fish, wave to the passing cruise ships or simply enjoy the ocean breezes. Jewish Museum of Florida: Supported by Florida International University, the Jewish Museum focuses on the Jewish experience in Florida. The core exhibit, MOSAIC, explores 250 years of Jewish life in Florida. The museum also sponsors films and Jewish food walking tours. Joe’s Stone Crab, the iconic restaurant that began as a lunch counter in 1913, still draws crowds for its seafood, especially the stone crab claws. Along with oysters, Izzy’s Oyster Bar features chowder, clams, lobster rolls and a catch of the day. Red, the Steakhouse, serves steaks, chops and seafood; Europa Delicatessen & Gourmet Market, has sandwiches, including schnitzel, as well as salads and European beers; and Cibo Wine Bar offers a wide array of wines plus home-made pastas and pizza plus southern Italian specialties. 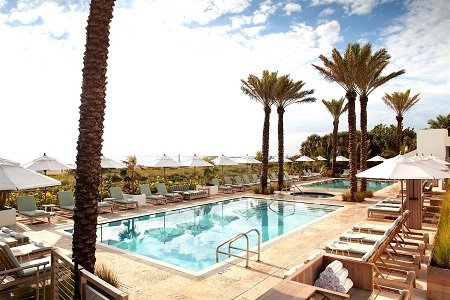 The Marriott Stanton South Beach fronts the oceans, something of a rarity in SoFi. The original Art Deco Stanton hotel, now houses a Starbucks (convenient) and some rooms. More than $20 million in renovations since 2013 create a “beach chic” décor of soothing beiges and whites in the guest rooms and a front desk backed by wooden shelves with starfish, seashells, dried flowers and photos, the kind of knickknacks you’d display in your own beach house. The property features two pools and a sundeck with chaise lounges. Transformations continue with four new restaurants slated to open, including a Mexican eatery in November and a Japanese restaurant with a “secret” (small) sushi bar in January 2017.